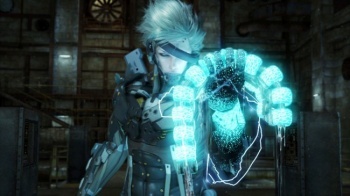 A lot's changed in the new Metal Gear Solid: Rising trailer. Konami promised to reveal the truth about Metal Gear Solid: Rising at tonight's Spike VGAs, but it looks like that truth may have gotten away from the publisher. A three minute trailer found its way online, and revealed - among other things - that the game is being developed by Platinum Games, the studio behind Bayonetta. Also revealed in the trailer is the game's new name, which drops the "Solid" and adds the rather goofy sounding "Revengeance" subtitle. Rumors that Platinum Games was working on Rising have been circulating for a while and although Platinum denied them, this trailer seems to suggest that the studio wasn't being entirely truthful. Besides Bayonetta, Madworld and Vanquish, many of Platinum's staff had a hand in shaping classic Capcom franchises like Devil May Cry, Resident Evil, and Viewtiful Joe. Not a bad resume for a studio working on a stylized action game with a ton of melee combat. The trailer itself puts me in mind of the anime trailers of the early 1990s, back when anime was a new idea; it's actually a little eerie just how similar this new trailer is to the ones I watched as a kid. The game also looks to be a pretty big departure from the tone and ethos of the rest of the Metal Gear series; although if Konami wants Rising to be a franchise in its own right, that might just be the point. You can watch the trailer here, but you might need to be quick as Viacom - the studio behind the Spike VGAs - is cracking down pretty hard on any versions it can find. Alternatively, you could wait a few hours until the show starts, and watch it then. UPDATE: Here's the trailer itself in all its glory.